"What did you have in mind for your next move?" The time has come for the world's greatest X-Wing™ aces to plan their next moves. For nearly half a year, the game's top bounty hunters and squadron leaders have been flying to battle in the 2018 System Open Series, looking to claim both prizes and fame. We've seen fantastic starfighter duels waged everywhere from PAX Unplugged to Portland and from Kraków to Birmingham. We've seen players adapting to the ever-evolving metagame. 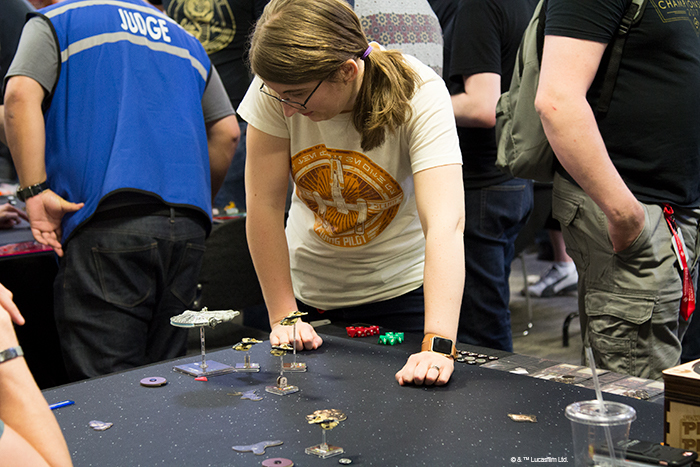 And as much as we've seen some truly top-level competition, we've also seen these events turn into fantastic celebrations of all the different things that make X-Wing such a great game: the detailed miniature starships, the intuitive maneuvering, fast-paced combat, and—above all—the enthusiastic and welcoming player community. Now, as the 2018 System Open Series draws toward a close with the event in Seattle, we look forward to the culmination of these tournaments at the 2018 Coruscant Invitational. Scheduled for the weekend of October 5th – 7th in Roseville, MN, the 2018 Coruscant Invitational will be not only the culmination of the 2018 System Open Series; it will be the first major competitive event for X-Wing Second Edition! Open only to those players who qualified through the 2018 System Open Series, the 2018 Coruscant Invitational will serve as a thrilling transition to the game's second edition. As such, the event will feature everything that makes the second edition such an exciting prospect—refined gameplay, a renewed emphasis on maneuvering, reinforced faction identities, the game's new app, and the integration of the Force and Force powers! The main event will begin on Saturday the 6th and feature six rounds of Swiss. Everyone with four wins will qualify for Day 2 on Sunday the 7th, which will jump straight into single elimination play. Byes will be awarded to the top players from Day 1, and the end of the day will see the crowning of a new Coruscant Invitational Champion! There will be a number of side events, as well. Before they launch into the second edition fighter battles of the main event, players will enjoy one final, massive battle. A Team Epic tournament on Friday the 5th presents an opportunity to field all manner of first edition starfighters—as well as a huge ship or two. Then on Sunday the 7th, there will be a special side tournament for all those players who were eliminated on Day 1, as well as those who are eliminated during the earlier rounds of Day 2. All listed times are CDT (UTC/GTM -0500). Exact times subject to change. We'll stream featured matches throughout the weekend—hosting them on our Twitch channel and aiming toward a wide range of different ships and squad builds. We'll build toward the event with a series of articles that will help newer players learn from our veterans and better understand what they'll later see on the stream. And we will once again invite everyone to participate in a series of Twitter polls that will help to shape the event itself… Even if you can't attend, you can help steer the fate of your favorite faction. Of course, there will be prizes, too! 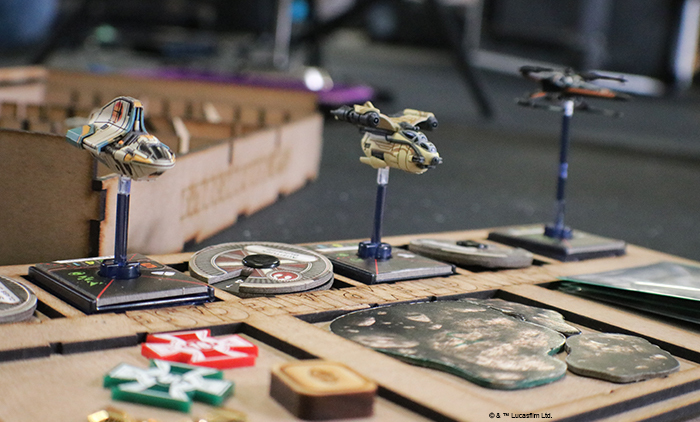 All the squadron leaders and bounty hunters who fought their way toward qualification during the 2018 System Open Series will find themselves rewarded with a cascading cache of prizes that keeps coming throughout the tournament—round by round. 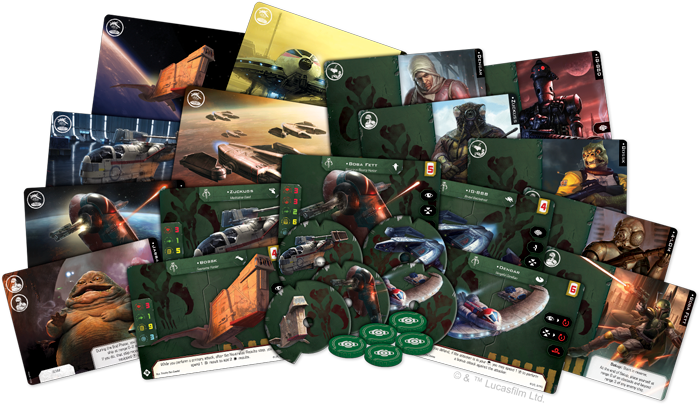 Naturally, these prizes will keep with the year's focus on the Scum and Villainy faction, even as they feature some of the newer and cleaner designs from the game's second edition. Participants in the 2018 Coruscant Invitational will win new prizes in every round they play on Day 1, and they'll claim additional prizes for every round they win on Day 2—whether in the elimination brackets or in Sunday's side tournament. 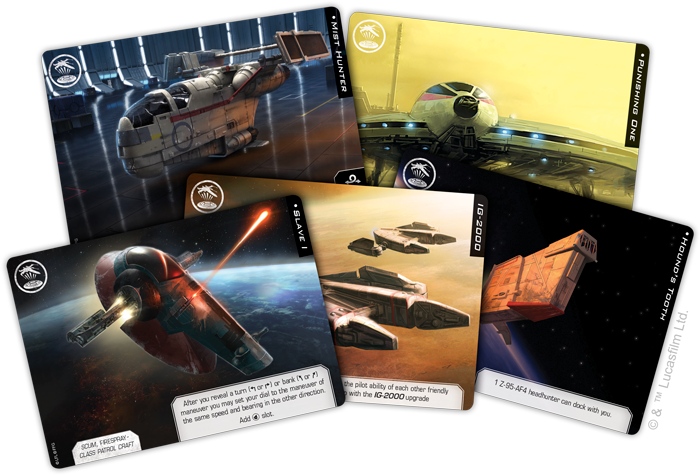 Commemorative damage deck reinforcing the year's focus on the Scum and Villainy faction. 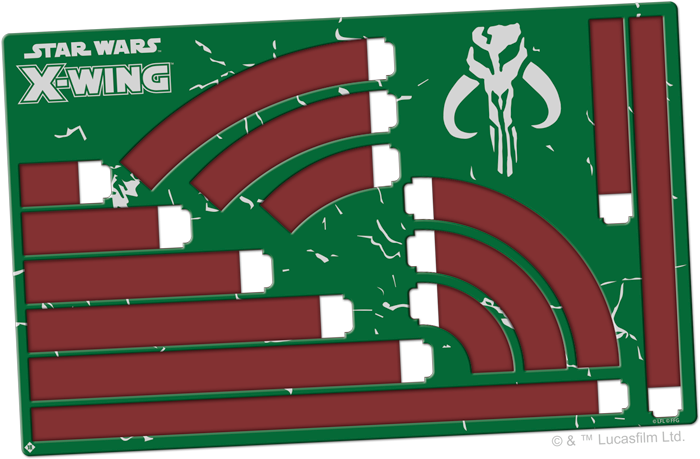 The alternate card back features the skull-shaped Mandalorian symbol known as the kyr'bes, and each card is marked with the 2018 Coruscant Invitational's event icon. 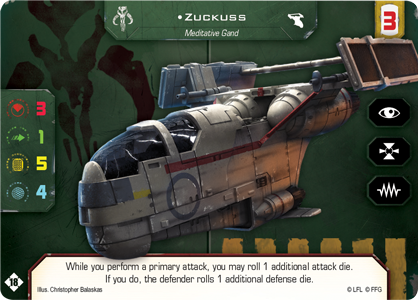 Alternate art Zuckuss ship card. 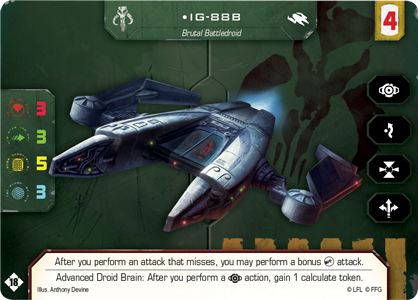 Alternate art IG-88B ship card. 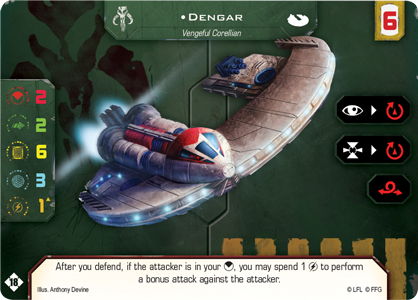 Alternate art Dengar ship card. 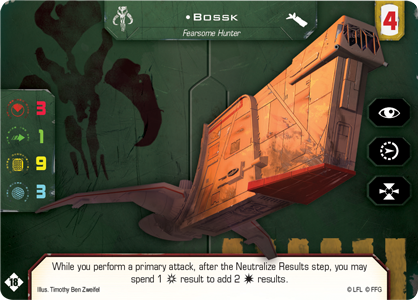 Alternate art Bossk ship card. 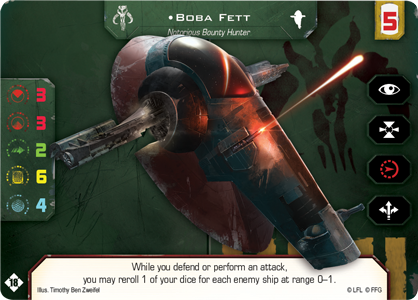 Alternate art Boba Fett ship card. After the conclusion of Day 1, everyone with four or more wins will qualify for the elimination rounds on Day 2. Top players will be awarded first-round byes; the exact number of byes awarded will be determined by the number of qualified participants. 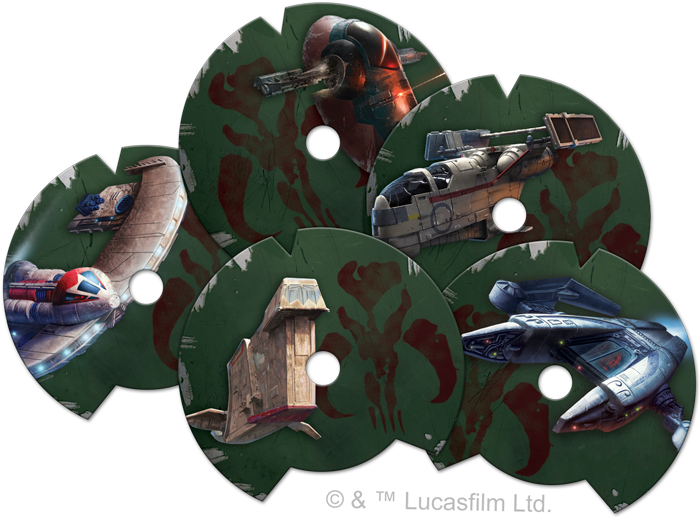 Set of five extended art Title upgrade cards: Slave I, Hound's Tooth, Mist Hunter, Punishing One, and IG-2000. Set of five acrylic calculate tokens. 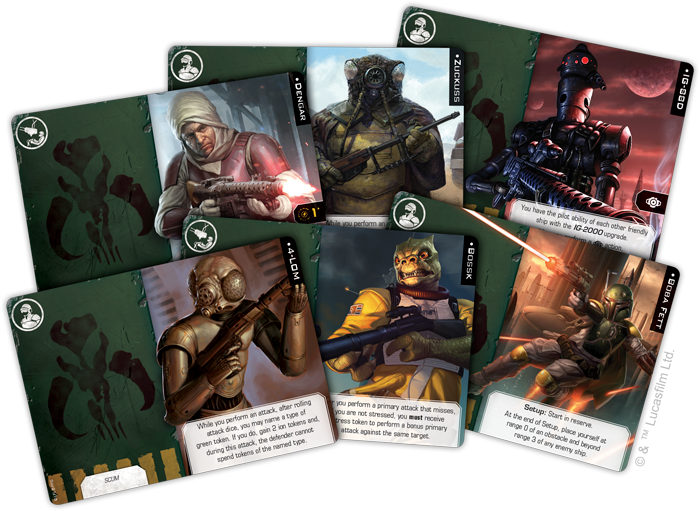 Set of six alternate art crew cards: Boba Fett, Bossk, Zuckuss, 4-LOM, Dengar, and IG-88D. Set of five commemorative maneuver dial covers: Firespray-31, YV-666, G-1A Starfighter, JumpMaster 5000, and Aggressor. 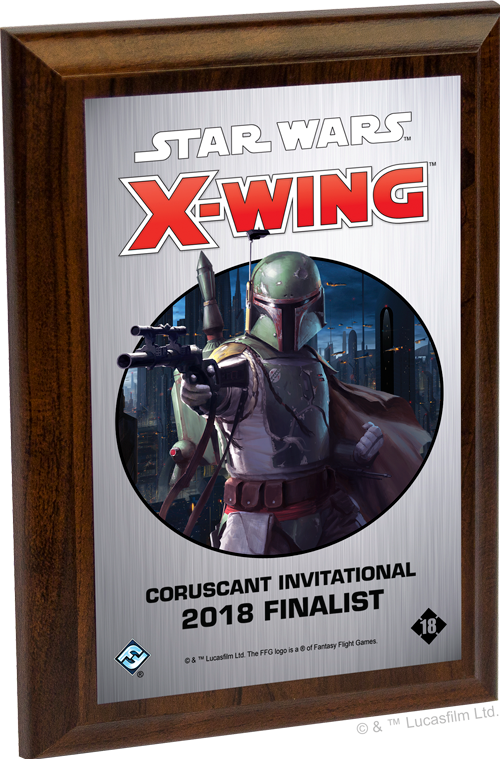 The 2018 Coruscant Invitational Runner-Up will also receive a 2nd place art plaque featuring Boba Fett. In addition to everything else he or she has already won, the 2018 Coruscant Invitational Champion will receive a Champion trophy, as well as a flight and lodging to the 2019 X-Wing World Championships! We will reveal more details about the 2019 X-Wing World Championships in the weeks to come. Each participant in the weekend's Team Epic Event will receive an alternate art Jabba the Hutt crew card. Each participant in Sunday's side tournament will have a chance to win the title cards, acrylic calculate tokens, alternate art crew cards, and maneuver dials that they did not already win during the Day 2 elimination rounds. Participating in Sunday's side tournament will earn you the set of the five ship title cards awarded to each player in the single elimination rounds. Win one game, and you'll qualify for the set of six acrylic calculate token awarded to each player in the Top 16 of Day 2. Win two games, and you'll qualify for the six alternate art crew cards awarded to each player in the Top 8 of Day 2. 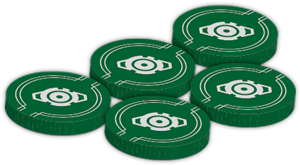 Win all three rounds, and you'll claim the set of maneuver dial covers awarded to each player in the Top 4 of Day 2. The side events will have prizes, too, as the players in Sunday's side tournament will have their chance to to claim the same prizes that the Day 2 competitors can win through the first three rounds of elimination play. 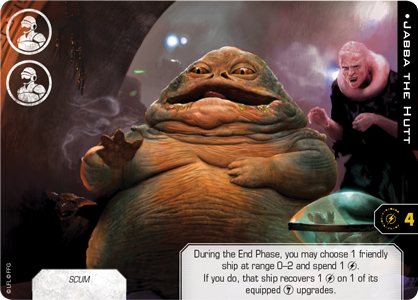 And the players in the Team Epic event will each walk away with an alternate art Jabba the Hutt crew card. But the prizes don't stop there! As part of our celebration of X-Wing Second Edition and the fantastic X-Wing community, we'll be giving away a handful of second edition prizes over the course of the weekend—everything from single ship expansions and conversion kits to complete copies of the X-Wing Second Edition Core Set intended to welcome new players to the party. The details of these giveaways won't be broadcast until we go live during the event, so be sure to follow our Twitch coverage and to follow us on Twitter @FFGOP! 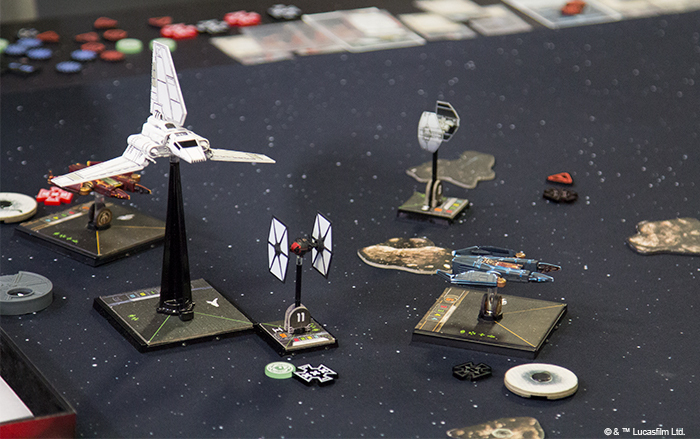 The 2018 Coruscant Invitational is coming to the Fantasy Flight Games Center this October 5th – 7th, and it promises to be one truly epic celebration of X-Wing Second Edition! If you've qualified through the 2018 System Open Series, head to our registration page now. The main event is completely free, and we hope you'll attend to help us usher in the new edition in style. If you haven't qualified, be sure to check our 2018 System Open Series page for the details of our last qualifying event. Then, be sure to stay tuned as we share more event details, including the way you'll be able to influence the shape of the event and improve the chances of your favorite faction. 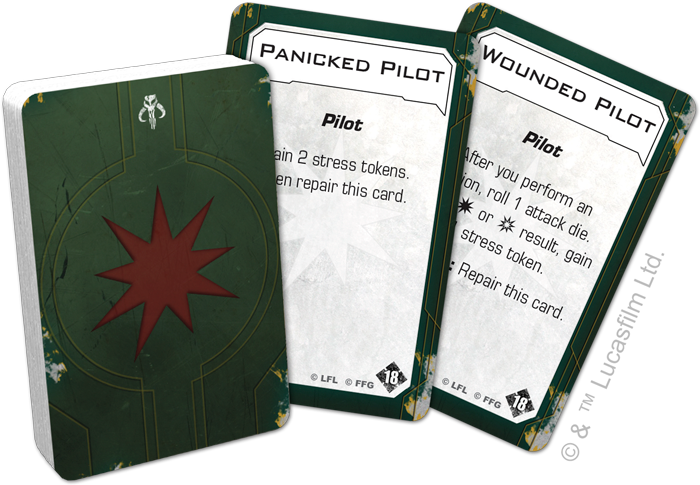 Along the way, we'll take a look at some of the coversion kit upgrades that are brand new to X-Wing Second Edition!